Valentine’s Day is tomorrow and for me going out to a restaurant for dinner is not going to happen. As a rule I hate going out to dinner on a Saturday night because of crowds and being out on a day where everyone’s couple-ness is on display doesn’t seem all that fun to me. Though I have to admit that many years ago, Cornelius and I went out for a very late Valentine’s Day dinner. The restaurant was somewhere in the West End of town and it was all tricked out in pink twinkle lights and shiny red hearts. We walked by and picked it based on gaudy decor alone. I have photographic proof of being lit up in a rosy glow (man, my hair was short!) and while the food was instantly forgettable, I was charmed by just how Valentines-ey it all was. I harbour no ill will towards V-Day, I embrace it! This year, we have no plans other than just being together and hanging out. There’s been a lot of late night and work for the past several weeks and it’s been exciting and great, especially coming off such a dud of a year (thanks for nothing, 2014!). After being in LA last November, we went back for a few days in January. I walked for miles and miles in LA while my husband was in meetings and then we cozied up in Silver Lake for a weekend. We went to the Getty which was incredible. We had delicious margaritas on the outside patio at El Chavo in Los Feliz with friends. Drank great beers Sunset Beer and Mohawk Bend. Ate great ramen at Daikokuya in Little Tokyo. Gazed at the moon – and at the general amazingness of the building & signage – at the Griffith Observatory. I drank iced coffees on any patio I could find, used Uber for the first time and enjoyed inexpensive taco truck tacos. The weather, this time, was amazingly warm and sunny so that added some spring to my January step. I can’t wait to go back. LA, you’re so much better than I ever thought you could be. And you know what else is great? This dark chocolate bourbon mousse. 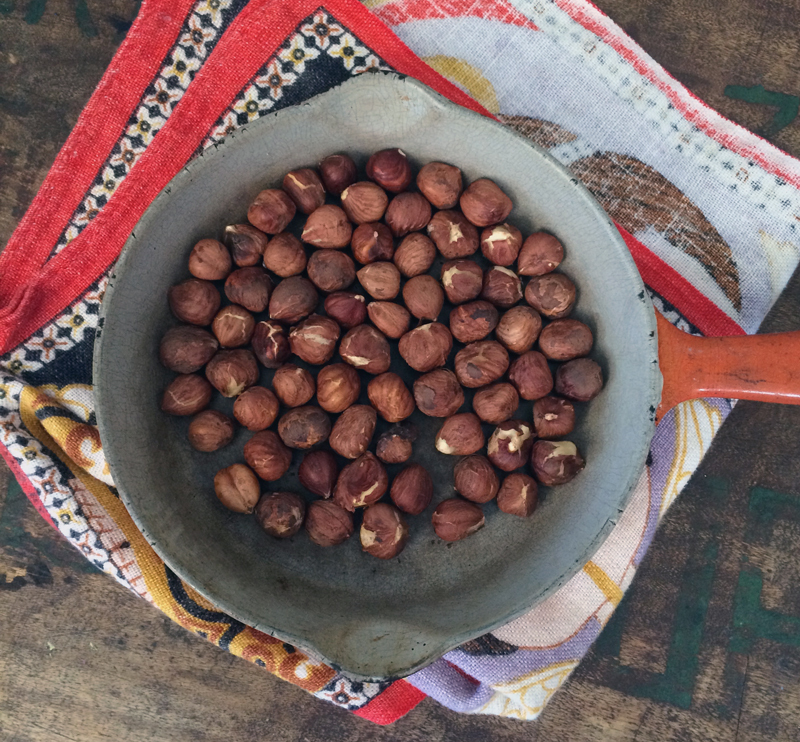 With toasted hazelnuts sprinkled on top to add a nice crunch. 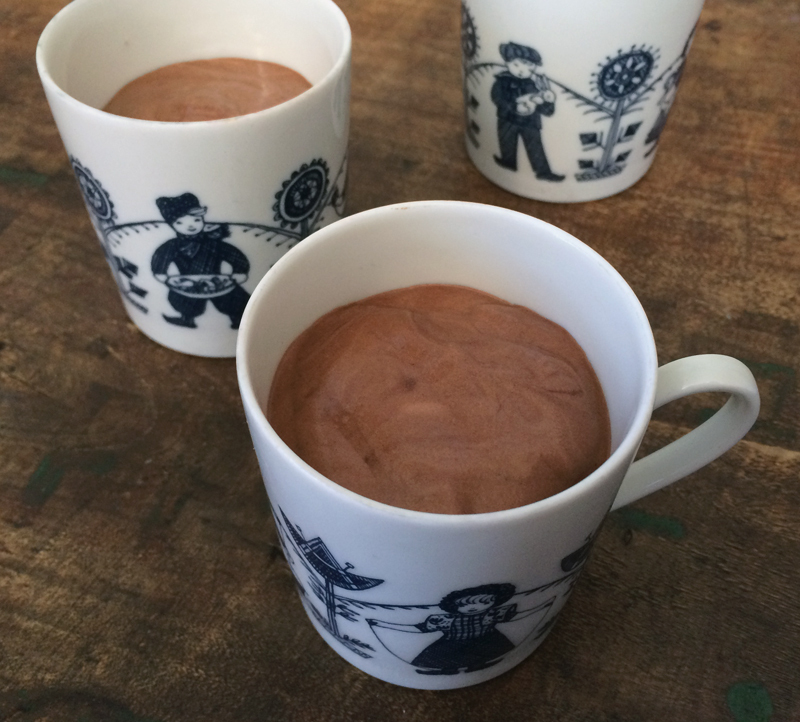 Served in super cute and oh-so-tiny vintage Dutch espresso cups. I made this recipe back in December. It was supposed to be our Christmas Eve dessert, but I totally screwed up and bought half-and-half cream instead of full fat heavy cream. I had already melted the chocolate and was wondering why my cream wasn’t setting up. Damn. So I let the chocolate cool, covered it with plastic wrap and let it sit for a week on the counter. On New Year’s Eve day I was prepared. I had whipping cream in the fridge and friends coming over for dinner. There’s a lot of steps to this dessert, but it’s not too fussy – just make sure you buy the right kind of cream! Cream, eggs, chocolate and bourbon. Nothing to it really. Everyone loved this mousse. It was dark and silky and as light as air. It’s a perfect special date dessert. Serve this to the one you love best. If you’re flying solo, there’s no need to share it with anyone. Enjoy it. Happy Valentine’s Day! If you don’t want to use bourbon, use whiskey! Or use some dark espresso. It will be good. Whip cream into soft peaks and then refrigerate. Set up a double boiler or bain marie and melt the chocolate and butter together. Stir frequently until smooth. Remove from heat and let cool until warm – the chocolate should feel warm to your lip. While the chocolate is cooling, whip the egg whites until foamy. Add in the sugar and continue whipping until soft peaks form. 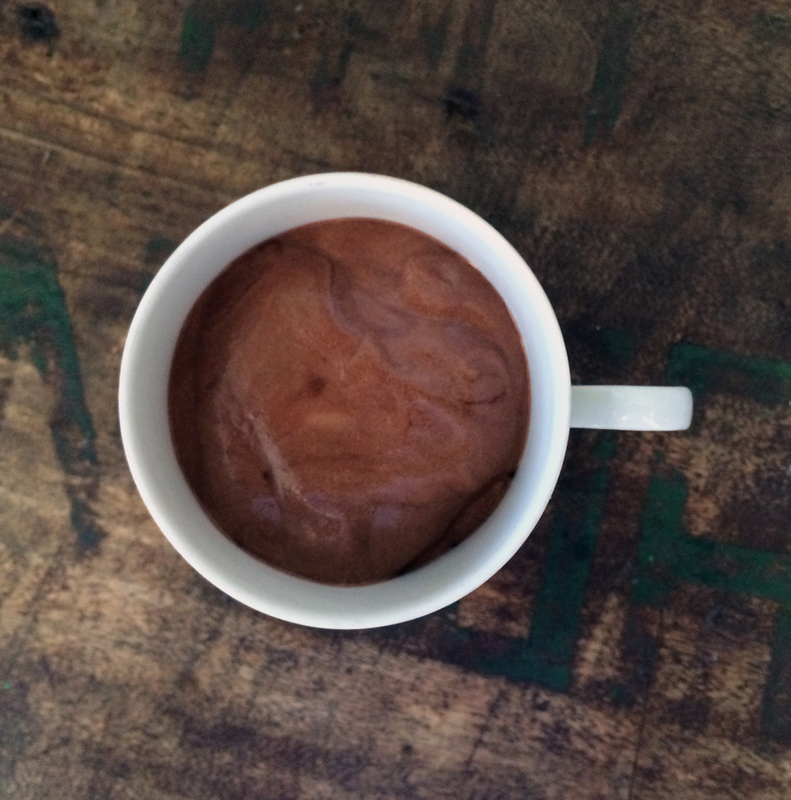 When the chocolate is at the correct warm temperature, whisk in the yolks and the bourbon. Stir in a third of the whipping cream and incorporate. Stir in half of the egg whites and slowly blend, then add in the remaining egg whites and when that’s incorporated, add in the rest of the whipping cream. 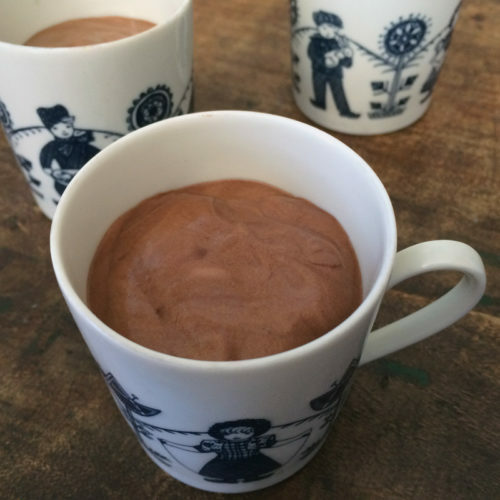 Spoon the mousse into small serving cups or dishes and cover with plastic wrap. Refrigerate for 6 hours. Sprinkle each cup with the toasted hazelnuts and dig in. Ditto. We stayed home for Vday. Your trips to LA sound amazing! Will you be going back again? Mmmm, the chocolate mousse with hazelnuts looks soo delicious!! 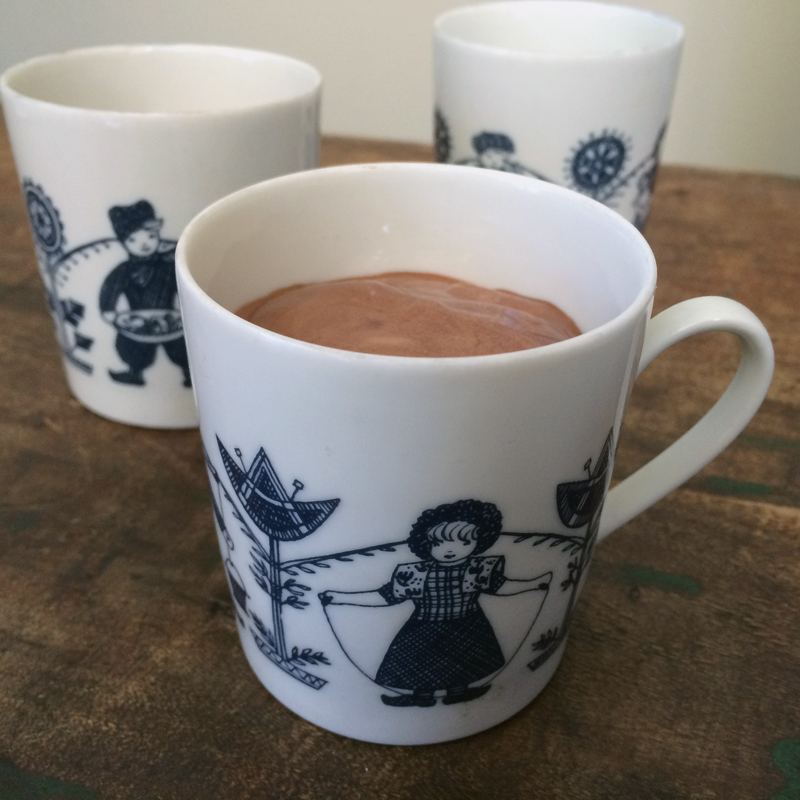 And those mugs are so stinking cute!!! Joanne, the mousse was really great. And I’m hoping for another LA trip sometime soon – fingers crossed! Chocolate/Hazelnut is my all time favorite dessert combo. Can’t wait to try this!